I’ve had a pretty stupendous cold that I caught last week that has really knocked me for six – I don’t usually suffer so badly but this one was not a very nice one. Added to that, I’ve returned to university and started a master’s in community nursing. So it’s been pretty exciting, tiring and hectic all at the same time… Leaving me with little time or inclination to sew – despite having lots of things that I need to do! 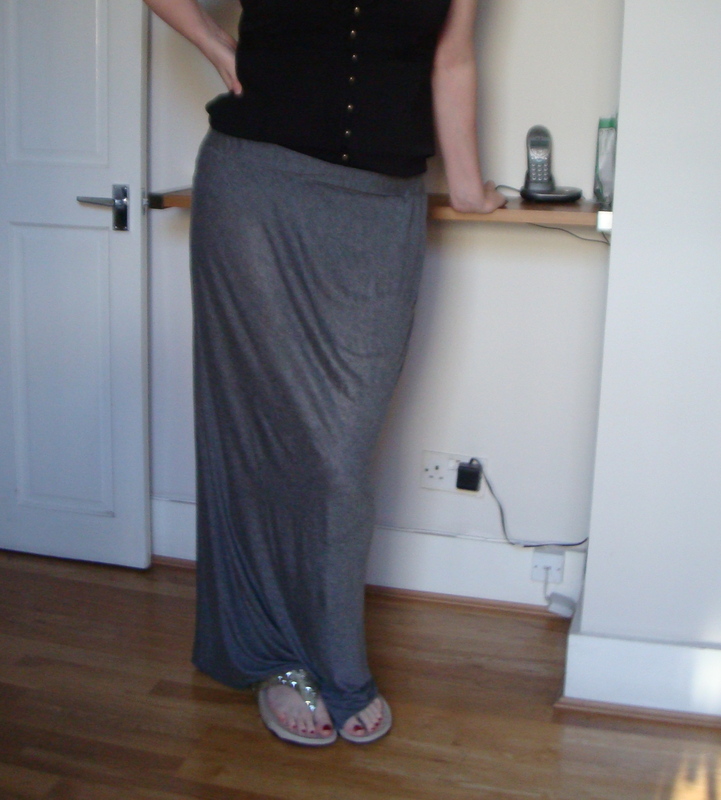 I love maxi skirts, my favourite skirt when I was about 17 was a woolly maxi skirt that I used to wear to school. I find them particularly flattering as they hug your curves and elongate your figure. Plus they are a great skirt for loafing, particularly great for the weekend – when you wake up feeling lazy and you want to wear something relaxed and un-fussy. So, I am pretty glad that they seem to be back in fashion again. 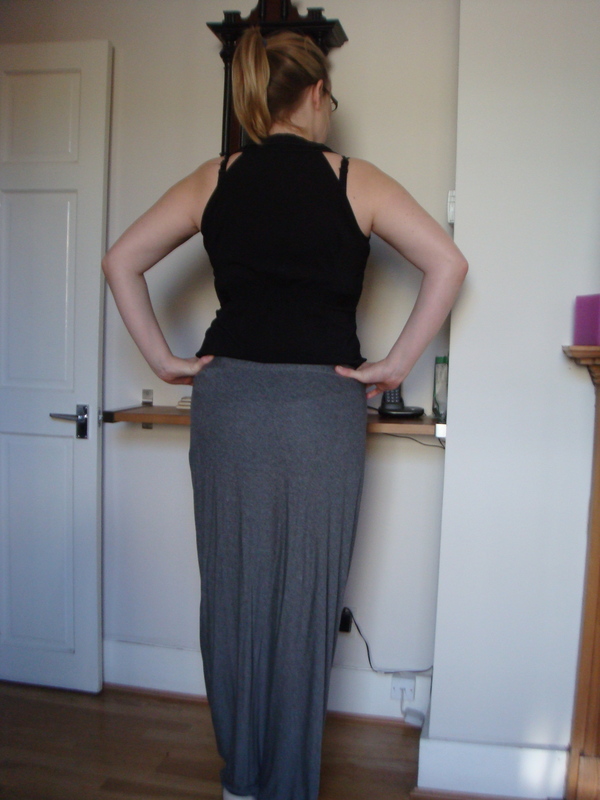 I chose a grey jersey from fabrics galore with a wide encased elastic waistband. I cut it on the bias, so in theory it should be more flattering… Although the fabric itself is quite drapey so I doubt it has made that much of a difference! The waistband admittedly is a bit of a mess because I wasn’t feeling well enough and therefore didn’t have my usual amount of patience. There’s a lesson for me somewhere! Still, it’s wearable which is the main thing and sometimes I need to be less critical of the things that I make and just wear the d*** thing! What a lovely, easy to wear piece! This would be good in winter too. I could definitely see it with boots and tights. I can’t even see the waistband. You would probably not wear anything tucked in anyway I am thinking. Thanks! I agree, I think the skirt would look really cool with some boots, maybe some biker boots?? No you’re right, I won’t be wearing anything tucked in! Thank you! I have to say I am a big fan of grey and if I’m not careful my entire wardrobe becomes different shades of grey!